One of my hobbies is making movies—shorts, for the most part. And with my team, Firmament Films, we’ve seen some success with our shorts, winning the 48 Hour Film Project in Madison for the past three years. The 48 Hour Film Project is a challenge where teams must write, produce and edit a 4-7 minute film within 48 hours. Teams receive their genre, a line of dialog, character, and prop and are sent off for a stressful and sleep-deprived weekend. 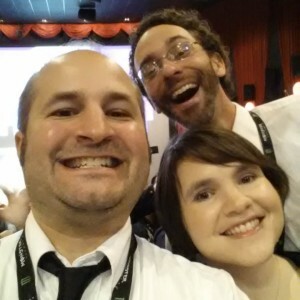 A few months ago, my team and I went to Hollywood to the 48 Hour Project Filmapalooza to celebrate Game Day, our winning entry in the 2014 Madison 48 Hour Film Project. It was an awesome six day trip. I enjoyed being a tourist seeing the Getty Center and Griffith Park, plus getting to watch so many of the other films. This year there were 125 winning films out of an estimated 4600 total films created across the planet for this competition. The days leading up to the Awards Ceremony were filled with seminars, film watching and mingling with other filmmakers. Talking to peers from Mongolia, Rotterdam, Nashville, Milwaukee—it didn’t really matter—it was an amazing experience. Most of the festivities were held in the TCL Theater, formally known as the Grauman’s Chinese Theater. It’s where the Hollywood elite have their hand and foot prints immortalized in concrete (my hands are the same size as Clark Gable! ), which is right next to the Dolby Theater where the Oscars where just held. We had a pretty good feeling about our film—people recognized one of our stars and other teams were singing our songs (it was a musical after all). On Saturday night they announced which 12 films would be played prior to the award ceremony and our hopes were high. We were a bit disappointed when Game Day was not named as one of the films— we thought we were out of the running for any award. Happily, when the awards started being called out, I noticed that it wasn’t just the 12 that were winning. Still, when we heard, “For Best Song, the winning film is Game Day, from Firmament Films”, we were stunned! It took us a few moments to register what we just heard. Of course, we were excited and almost ran up to the stage to receive our award. It’s still so unbelievable to think that we are now international award-winning filmmakers. Afterwards, there was of course a party hosted by the 48 Hour Film Project, where all the teams hobnobbed and discussed the films they saw over the past week. It was neat to get even more positive feedback for our effort—most teams see the musical genre as the most difficult to complete in the 48 hour time period. Overall, it was an amazing experience. I would encourage anyone interested in filmmaking to check out the 48 Hour Film Project, as it’s held in so many cities across the United States, or the 4 Points Film Challenge, which is similar, but is based on your time zone, not city. Congrats! It’s a fun experience! In 2004 I took first at the Austin Film Festival…So much fun being involved in things like that! Thanks! It was a ton of fun!